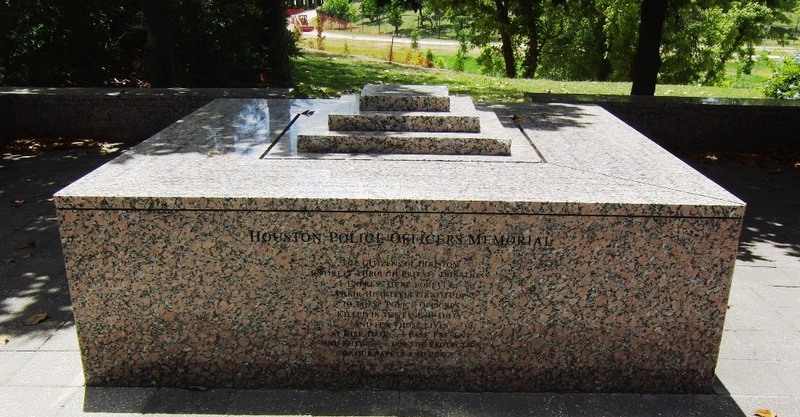 In 1990 a huge sculpture was erected in a park at 1400 Memorial Drive to honor Houston Police Officers who have lost their lives in the line of duty. Carved atop of this structure are the names of all 111 men who have died protecting our city. Regrettably, this number will continue to climb as time passes on. The artist was Jesus Bautista Moroles, known for his abstract chiseled granite sculptures. He developed a love of carving granite following a trip to Italy in 1979. Today Moroles’ works can be found in museums and collections around the United States. It cost $630,000 to complete. A group of local foundations and endowments funded the project. This carved grey Texas granite monolith is 120 feet by 120 feet. It is in the shape of a Greek cross (four equal arms) consisting of five ziggurat pyramids. Each pyramid is 40 feet on a side. 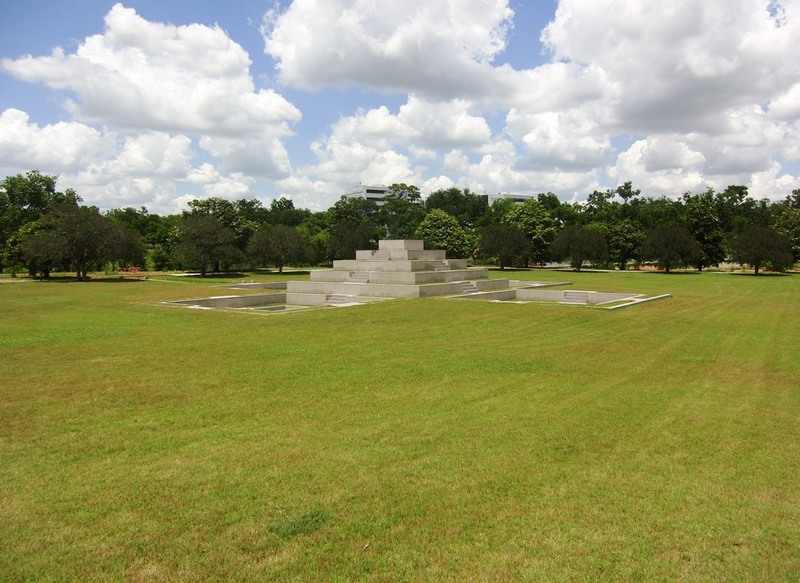 The central pyramid rises 12 feet above ground while the outer four are sunk an equal distance into the turf. 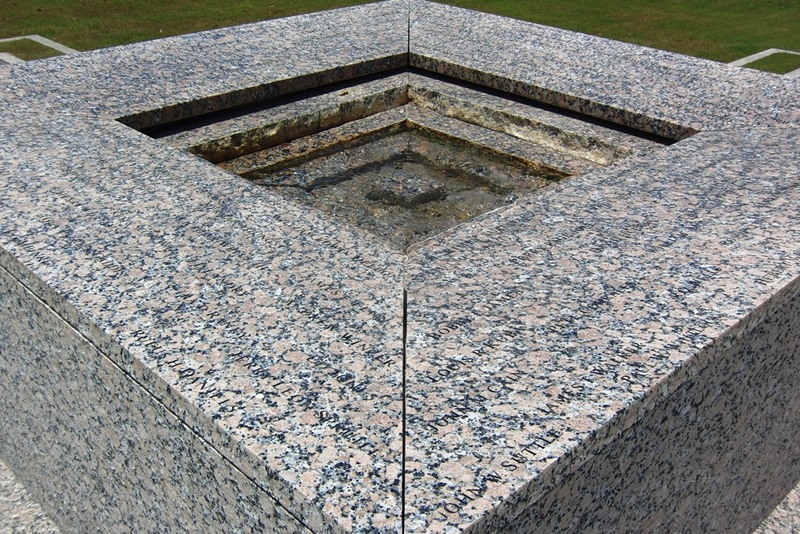 Atop the central pyramid is a square pink Texas granite reflecting pool. It is around this water feature that the names of the martyred officers are carved. The memorial is guarded 24-hours a day by volunteer Houston Police personnel. Near their guardhouse is a small maquette of the sculpture if you don’t chose to walk out to the original.